use for future buying and selling. Thank you A.J.!! For selling our house in Connaught. We are enjoying life in our new Country home in Bearspaw. You did a Great job for us. We appreciate everything you did to help us through such a stressful process. market situation being uncertain our house was sold within 2- weeks. I would highly recommend Ajit to anybody to be represented in the real estate environment, whether it is selling or buying a property. Ajit is easy to talk to, very efficient, honest and professional and always has your best interest in mind. Thank you for your outstanding work. A friend always. We recently bought our first home and can't thank Ajit Vora(A.J.) enough for all his help and support throughout the process. made sure we took our time to figure out what we wanted and not rush into something. He is patient, friendly and knowledgeable. He always gave his honest options about every house we looked at and we are so happy with the house we chose! 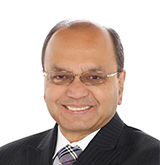 We would highly recommend Ajit Vora (A.J.) to our family and friends. Thank you! !